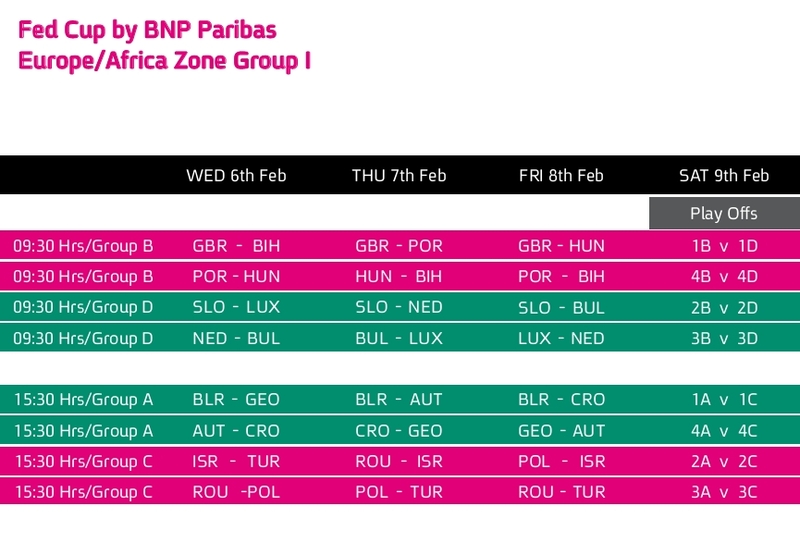 The Europe/Africa (read: Europe) Zone Group I event of the Fed Cup competition takes place in Eilat, Israel for the third straight year. 16 nations will compete in four pools of 4 teams, with the winners of each pool facing off for two spots in the World Group II playoffs, and the losers trying to avoid elimination. For those who want to get the details, here's a preview of what's to come. The morning matches will feature Group B, where Great Britain (Watson, Robson, Keothavong, Konta) are the favourites against Portugal (de Brito, without Koehler), Hungary (Babos, Arn) and Bosnia-Herzegovina. The winner of that group will play the winner of Group D - Slovenia (without Hercog), Luxembourg (without Minella but with veteran Anne Kremer), Netherlands (Rus, without the injured Krajicek and Bertens) and Bulgaria (Pironkova). The teams that come last at both groups will play to avoid relegation to Zone Group II. Groups A and C will play in the afternoon session. Group A could have been one of the strongest groups in the whole tournament, but all the teams are coming without their #1 player - Belarus is without Azarenka, Croatia is without Martic (but with youngsters Vekic and junior AO champion Konjuh), Austria is represented by Meusburger and Mayr-Achleitner (without Paszek), while Georgia doesn't have a single player in the top 250. That leaves Group D to be the toughest group, with two of the strongest teams in the tie - Poland (with both Radwanska sisters) and Romania (Cirstea, Halep, Begu). This group is also where the host nation, Israel, was drawn, to the dismay of the locals. Israel (Peer, Glushko) will have to beat Turkey, the last team in the group, if they want to avoid playing a relegation meeting. Poland is the favourite to make it out of this group, and they're likely to beat any opponent from Group A, finally putting them in the World Group II playoffs. Full lists of the players and the team captains can be found on the Fed Cup website. February 6 - February 9, with two sessions played each day. The morning session will start at 7:30GMT (8:30CET, 2:30EST), and the afternoon - at 13:30GMT (14:30CET, 7:30EST). The first three days of the tournament (Wed-Fri) will be group play, while on the final day all the teams play for either promotion, relegation or ranking purposes. Every meeting between two nations has three matches - the top ranked players play against each other, the second ranked players against each other, and finally there's a doubles match (which is played even if it's a dead rubber, to determine the group positions, except for the last day). All matches are best of 3 sets. The format of the competition, which sometimes requires players to play both singles and doubles for four straight days, is both an advantage and a problem. The matches are played simultaneously on 4 courts, with centre court broadcasted and streamed by the Israeli Sport5 Channel. Israel will play all of its matches on that court during the afternoon session, and Great Britain is the most likely candidate to feature during the morning session. Livescores will be available on the website of the Israeli Tennis Association when play begins. I will be covering the tournament from start to finish for Israel Tennis Results, so check out my tweets, pictures and press quotes on the new Let, Second Serve twitter account!